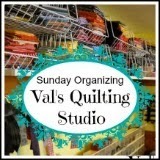 Val's Quilting Studio : Garage Sale Find! Thank goodness...cause I do love it! I thought your other card catalogue was cool, but too large for me, so I wasn't too envious. But this one is just the right size for me and I really want it. If you lived near by I would definitely be trying to buy it off you. Great find. Hard to believe I got it for ten bucks! That is adorable!! What a lucky find, I look forward to seeing what it gets used for, because you are sooooo organized! I know I'm so organized...but sometimes I think it's just cause I like to do so many things and it's my only way of keeping order. LOL!!!! Val.. How cute!! I loved those in the libraries..even went home and tore paper to make the "cards" and wrote title etc from the books I had to make my own card catalog! What a lucky find! You'll have to share what you do with it!